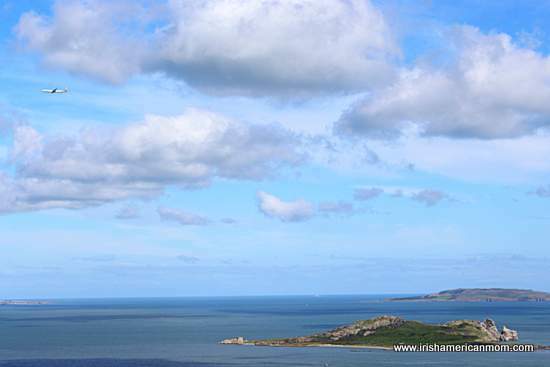 The Howth peninsula forms the northern arm of Dublin Bay and was one of my favorite childhood haunts. Less than 5 miles from where I grew up in Raheny, I loved to explore the hills and cliff paths of this majestic headland. I was looking through photos on my external hard drive the other day when I rediscovered some shots I took from the hill of Howth on a bright sunny day. 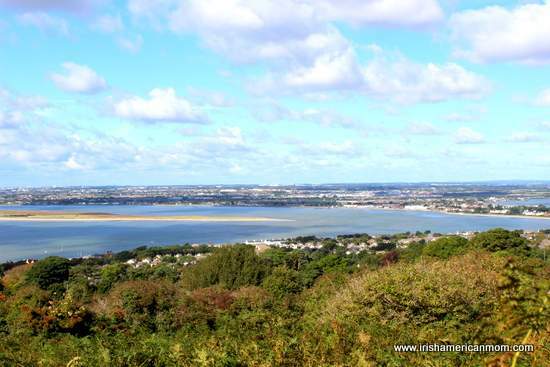 And so I thought why not take a little trip to Howth Hill. The views from the top are spectacular. Dublin Bay and the city stretch out before you to the south, and the islands of Lambay and Ireland’s Eye dot the Irish Sea to the north. 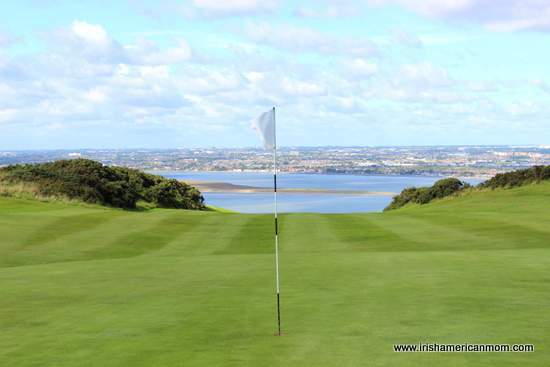 When sauntering between Shielmartin and Howth Hill the right-of-way meanders across Howth Golf course. From every corner of the course golfers can admire the city. 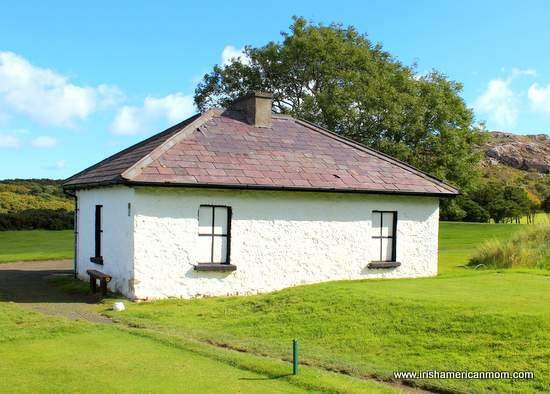 This little cottage on the golf course caught my eye. I’m not sure if anyone ever lived here since this old home is boarded up, but that little bench beneath the window is an ideal spot for a little rest, especially for anyone longing to drink in the beauty of Dublin Bay. And boy, oh boy, is Dublin beautiful when the sun shines. 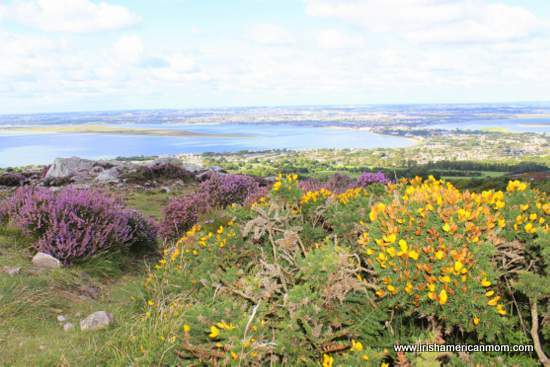 The views along the hilly path to the summit of Shielmartin Hill take in the entire sweep of Dublin Bay. 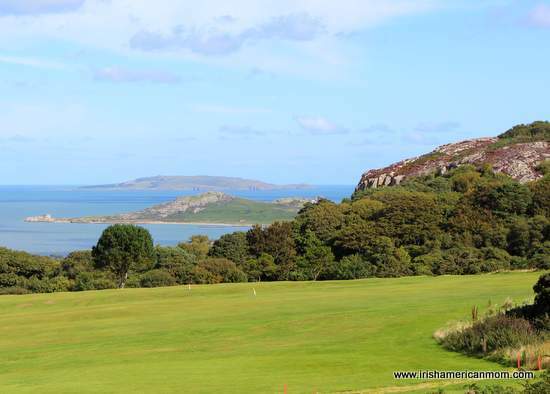 Shielmartin Hill rises to a height of 535 feet, and the Ben of Howth is a towering 561 feet, so I suppose the term “mountain views” may be a little bit of a stretch. The Ben is the highest point on the peninsula, but is crowned with communication masts. 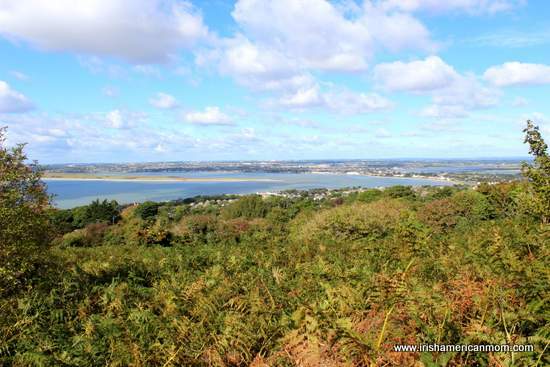 But whether these elevations are hills or hummocks, the panaromic views from the top are well worth the climb. Gorse and heather blanket these hills, adding a magnificent splash of color. 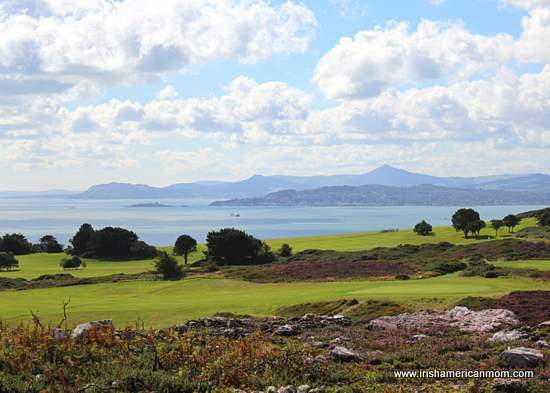 The Dublin and Wicklow Mountains rise in the distance, with Dalkey Island marking the southern arm of the bay. On a clear day the north Dublin coast line from Portmarnock and onto Malahide, Donabate, Skerries and beyond are clearly visible. If you’re very lucky even the Mourne Mountains in County Down can be seen. Howth harbor is a picturesque fishing village with it’s two piers reaching towards the island of Ireland’s Eye, sheltering the ships and boats moored in its waters. Just beyond Ireland’s Eye lies the larger Lambay Island, home to an ancient monastry founded by Saint Colmcille. The Vikings arrived here in later years, and as a child I imagined marauding Vikings landing on Lambay’s shores. In 1904 the island was purchased by the Baring family and they live there to this very day. 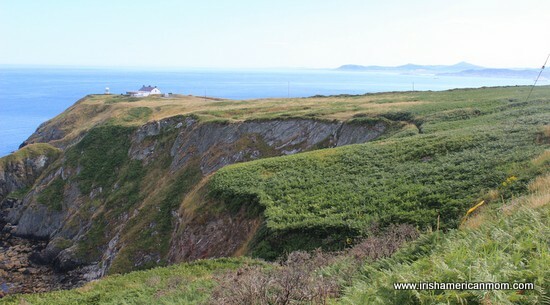 I have lovely memories of rambling across the bens of Howth with my grandaunt when I was a little girl. Rain or shine we trudged along these hilly paths, singing songs, reciting poetry and telling tales. My favorite stories told of Finn McCool climbing these slopes in giant steps. 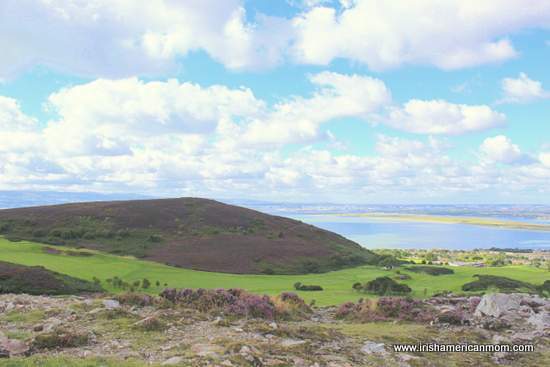 I imagined our ancient hero standing atop these bens surveying Dublin Bay and the Irish Sea. These hills are formed of quartzite, a magnificent rock of iron infused hues. 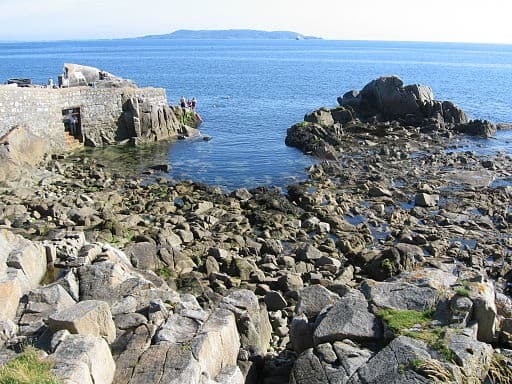 The quartzite of howth is beautiful with warm flushed tones of red, golden yellow and a rusty brown. But be fair warned quartzite can be very slippery when wet or frosty. Tread with care on the hills of Howth. 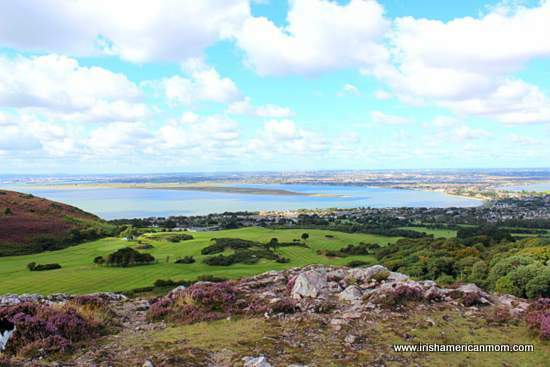 Here’s a little slide show I put together on YouTube with more of the photos I took from Howth Hill ..
And so if you find yourself in Howth, why not take a little saunter across its bens, and savor the beauty of Dublin and beyond. 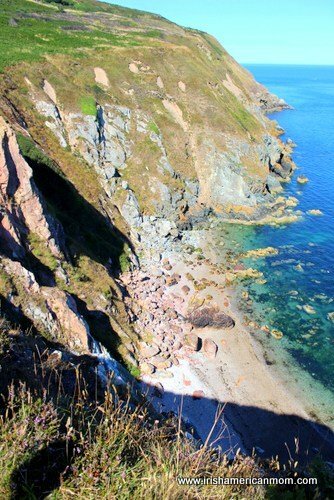 On the hill of Howth in north County Dublin a secret pirate cove awaits would-be explorers, daring enough to descend one hundred and ninety-nine steps carved out of the sheer cliff face. In my post today, I once again hope to take you off the beaten path, and help you discover some of Ireland’s hidden treasures. When I was a little girl growing up in Dublin, my grand aunt loved weekend outings with all my cousins in tow. 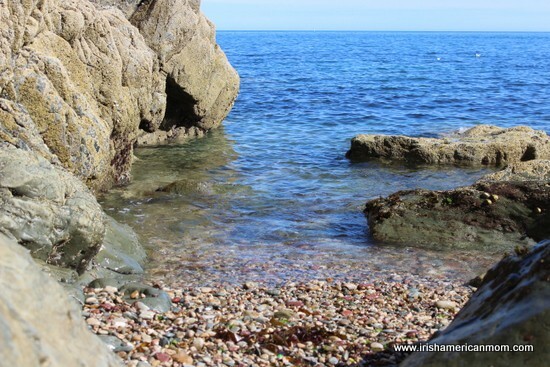 One of our favorite hang outs was on the beach at the bottom of the “199 steps” in Howth. 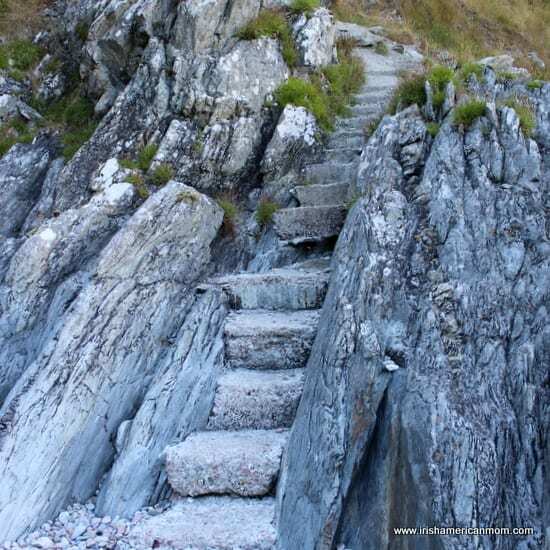 My cliff stair collage above shows how these stone steps are carved out of the cliff, winding their way from the shore to Howth summit. This is Grace O’Malley territory. The famous Irish pirate queen visited Howth on many occasions. My grandaunt loved to tell us this very cove was where Grace O’Malley always came ashore in Howth. Considering Grace O’Malley, or Granuaile in Irish (pronounced Graw-nea-wale) lived between the years 1530 and 1603, the truth of this tall tale may never be known. 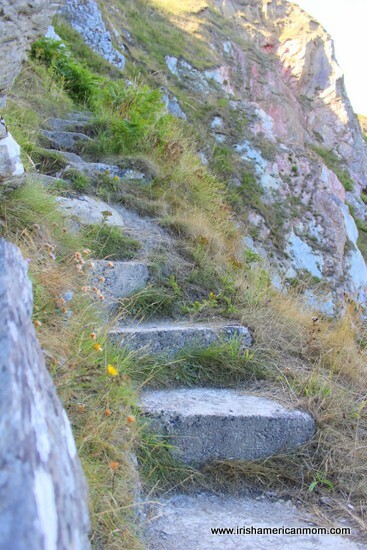 Undeterred my grandaunt relayed stories of pirates working by torch light to hack and cut 199 steps from the rocky cliff face, to allow their pirate queen ascend to Howth’s summit undetected by the English. 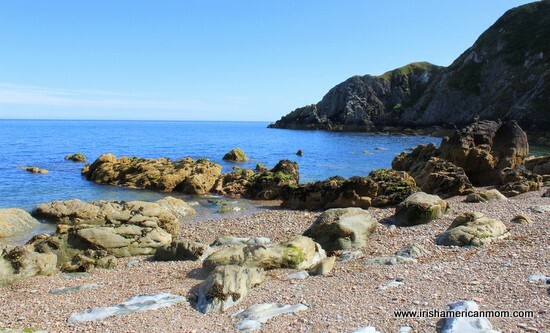 We loved to wind our way along the cliff path in search of the first step to this secret pirate cove. We looked down from on high dreaming of Grace’s lost treasure, just waiting behind some rock for our eager eyes to find. 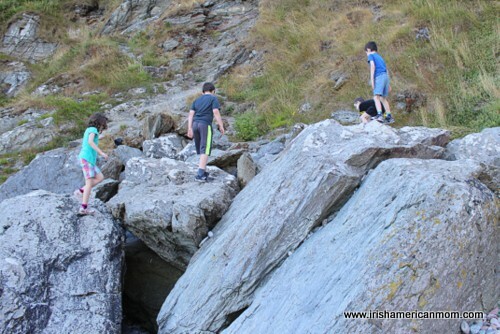 Last summer I rediscovered these secret steps with my children. Once I told them of potential pirate treasure, they made quick work of navigating the treacherous steps. A sense of mystery and magic awaits on the rocky shore below. 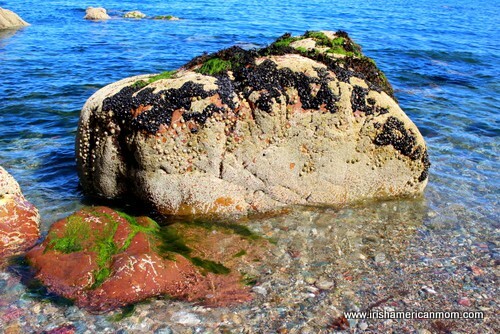 You can easily imagine the pirate queen herself standing on top of this barnacle covered rock issuing orders to her crew of Mayo men. This strange rock has not shifted since I was a little girl. 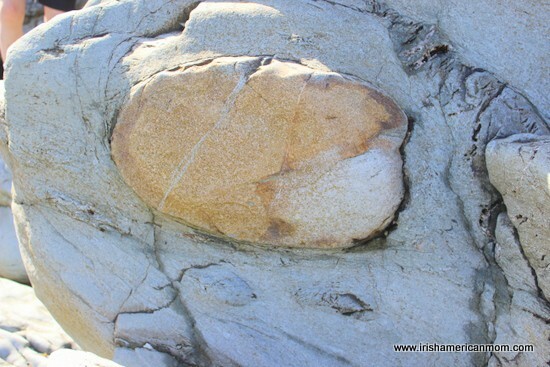 I imagined a big, strong pirate flung the smaller red rock across the beach with such force that it lodged into the larger boulder. I’m certain there’s a perfectly sound geological explanation for this rock formation, but let’s face it, nothing beats a good pirate story. This is no sandy beach. 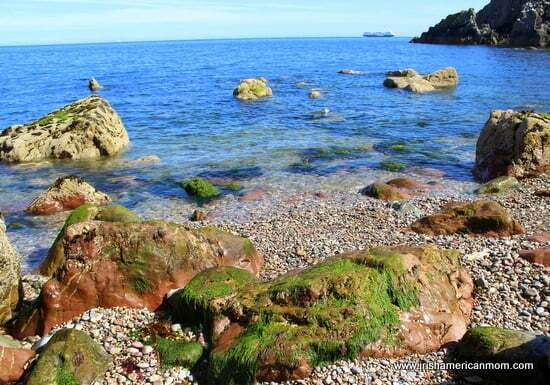 Shoes are definitely required for pebble covered shores…..
……. 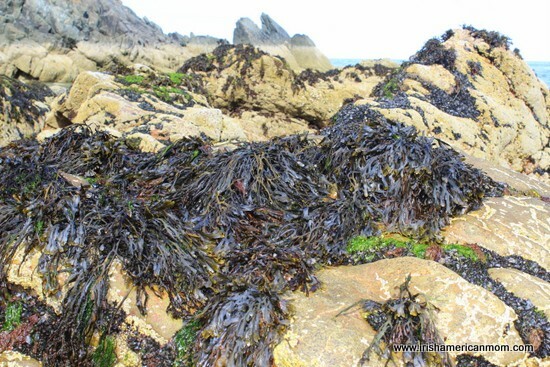 and seaweed strewn rocks. My kiddos were convinced Grace O’Malley’s treasure lay beneath the large rocks at the base of these cliffs. I spent hours as a child climbing those very rocks. In four decades they don’t seem to have budged even an inch. A small row boat could easily have been maneuvered close to the rocky shore at this very point, allowing the brave Grace reach dry land. O’Malley’s connections to Howth are not just part of my late grandaunt’s vivid imagination. In 1576 Grace O’Malley tried to call upon Lord Howth at his castle only to be informed the family was at dinner and she was not a welcome guest. This rejection did not sit well with the bold Grace. The Lord of Howth soon felt the full brunt of this pirate queen’s wrath, when she abducted his grandson and heir. 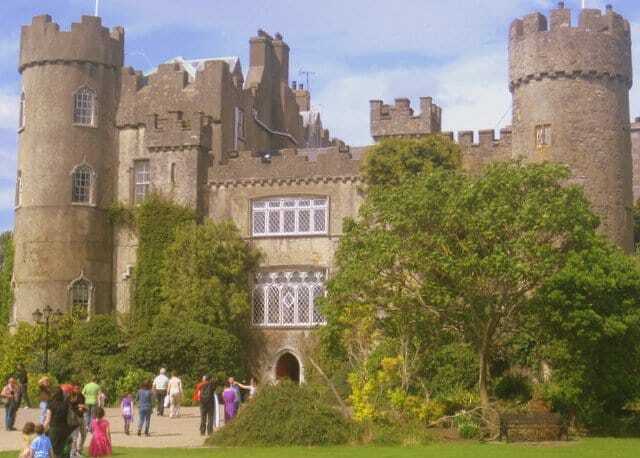 The terms of the child’s release included a promise from Lord Howth to keep the gates of his castle open to unexpected visitors, and to always set an extra place at every meal. This pledge is still honored at Howth Castle to this very day, with an extra place setting laid at table. I wonder if Grace’s ghost ever inspects the distance between the knife and fork. This ferry passed as we roamed the shoreline, following in the wake of pirate vessels from years gone by. What a day, imagining ghosts and pirates roaming around searching for treasure. And so, after an energetic day playing on a secret pirate cove in Howth, the long trek upward and homeward began. There are no cable cars or lifts to take treasure hunters back to the cliff top. 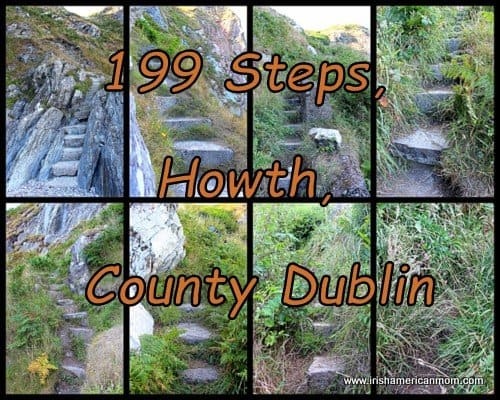 The only way home is to shift one foot after the other until all 199 steps are finally surmounted. For anyone interested in a stiff climb to a secret (or not-so-secret anymore) cove, access to the 199 steps lies on the left hand side of the cliff as you walk out the headland towards the Bailey Lighthouse. That’s all the information I’m willing to part with, and if you can’t find it, perhaps you’ll find the way on an old pirate treasure map. Wishing you all happy trails, discovering your very own hidden Ireland. Dublin is a charming, architecturally spectacular capital where medieval and modern history blend to create a vibrant, welcoming atmosphere. 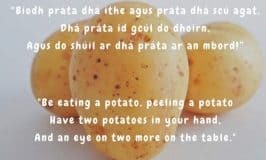 Yet Dublin offers much more. The county is home to often undiscovered villages, beautiful scenery and ancient castles. Dublin is my home town, so forgive me if today I sing her praises with pride. Dublin is not only a “fair city,” but a historical county and my childhood home. I was shocked, but no matter what legal or administrative divisions were created for ease of governance, Dublin is, and always will be, a county in the eyes of Irish men and women. 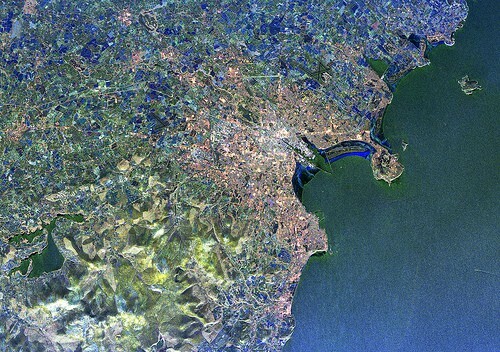 This wonderful satellite image from NASA shows Dublin city surrounded by its less densely populated county. 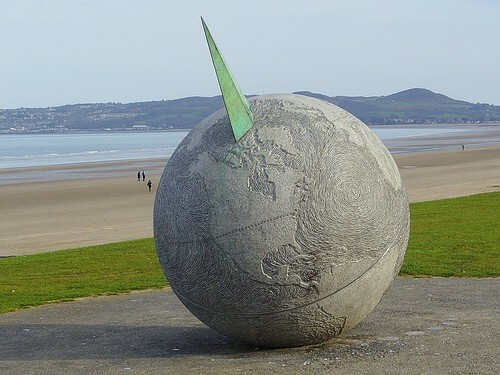 Dublin Bay is the horseshoe shape at the center, with Howth Head to the North and Dalkey Hill to the south. 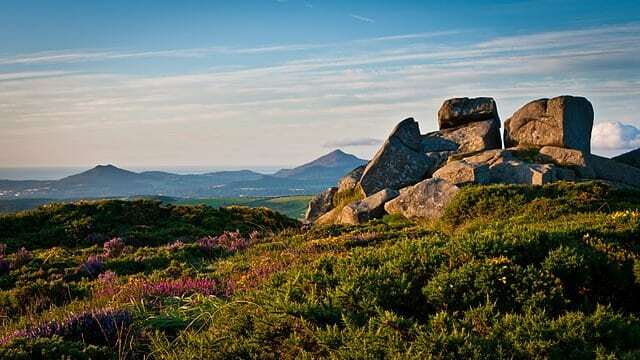 The Dublin Mountains lie to the south adjoining County Wicklow and its spectacular mountain range. 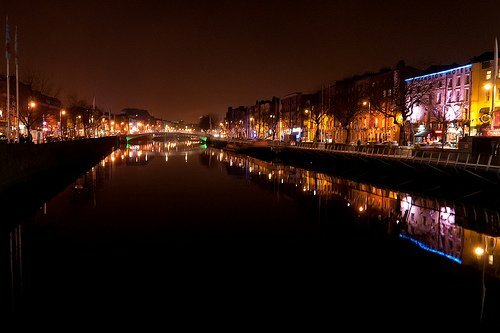 Dublin City dates back over 1000 years, it’s origins attributed to a Viking settlement in 841 AD. It’s name literally means Black Pool, from the Irish word ‘dubh’ meaning black, and ‘linn’ meaning pool. To truly do Dublin justice, this post should include hundreds of photos and stories. Instead I plan to limit our city center tour, so we can focus on the hidden gems of the county. But rest assured, we will explore Dublin City in many more posts and photos in the future. 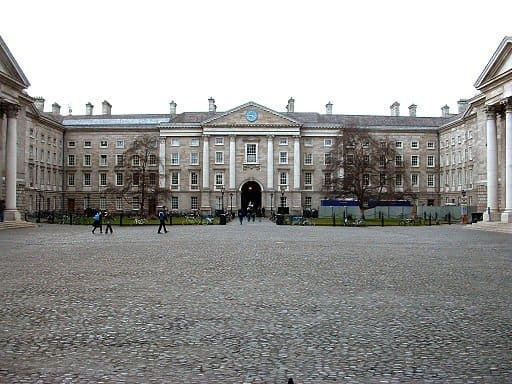 I could not visit Dublin, however, without mentioning my alma mater, Trinity College. This peaceful, beautiful campus with cobblestone squares, elegant gardens and classical buildings, lies right in the center of our bustling city. Official, student-guided tours of the campus are available. You can also see the Book of Kells on display in the magnificent old library building. 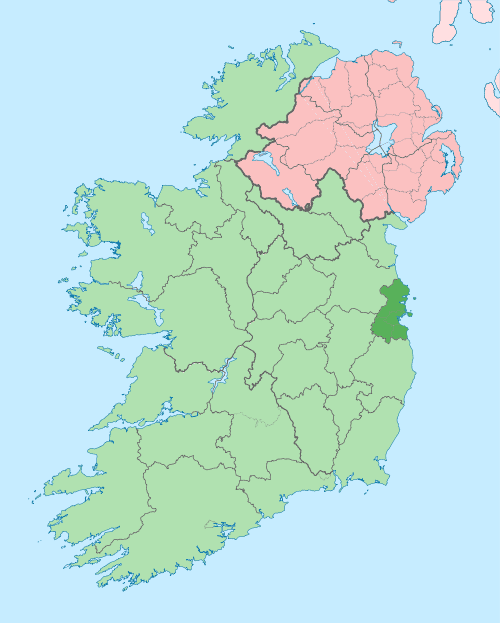 The River Liffey bisects the city and county into northern and southern regions. 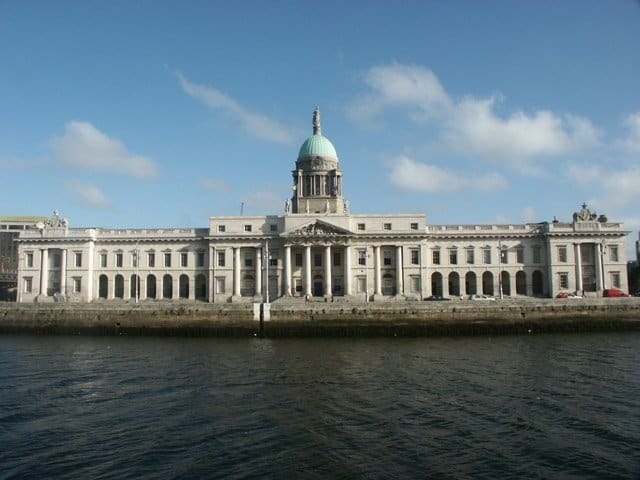 The banks of the river are lined with magnificent old buildings like The Custom House, which opened in 1791. 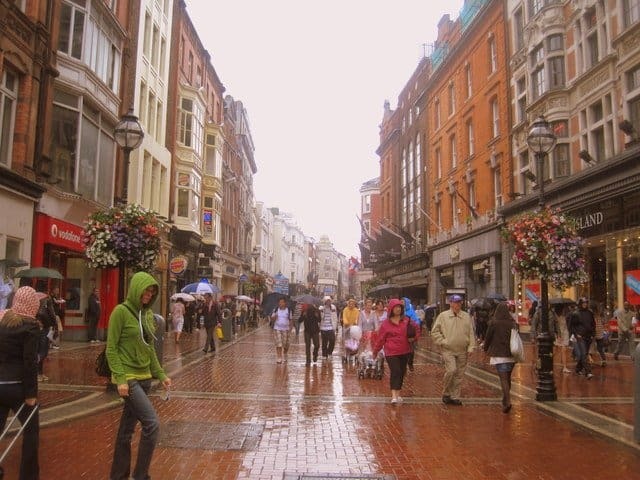 A Rainy Day On Dublin’s Grafton Street. Grafton Street is the main shopping thoroughfare on the South Side, with Henry Street being retail central for the North Side. A little rain never slows down Dublin shoppers who always carry umbrellas for emergencies. Dublin Castle was first established in 1204 AD, and has played a prominent role in Irish history ever since. Informative guided tours are available. Kilmainham Gaol (or jail) housed Irish prisoners between 1780 and the 1920’s. 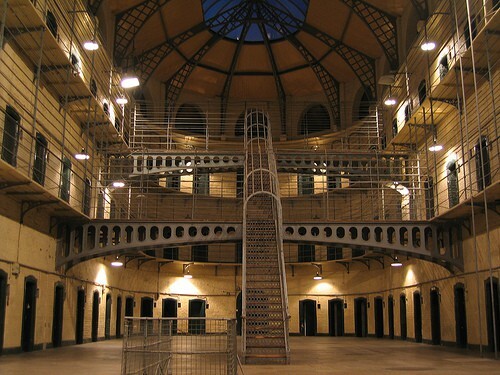 Unoccupied today, tours of the jail tell the story of Ireland’s tumultuous past. The Phoenix Park lies to the west of the city center. With 1752 acres it is the largest enclosed park in any European capital city. 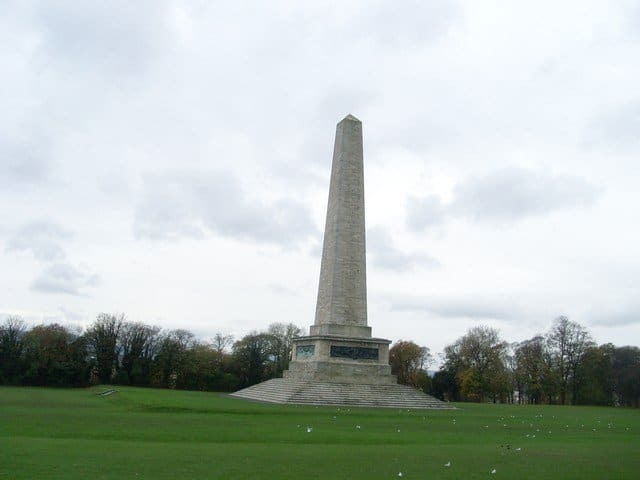 The Wellington Monument is a memorial obelisk dedicated to the Duke of Wellington, who was born in Dublin. 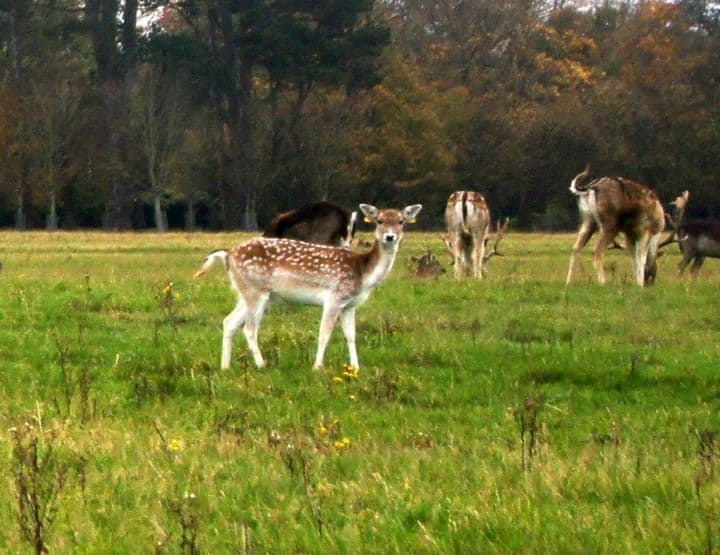 A herd of fallow deer still roam the Phoenix Park. Dublin Zoo dates back to 1831 and is located within the park. 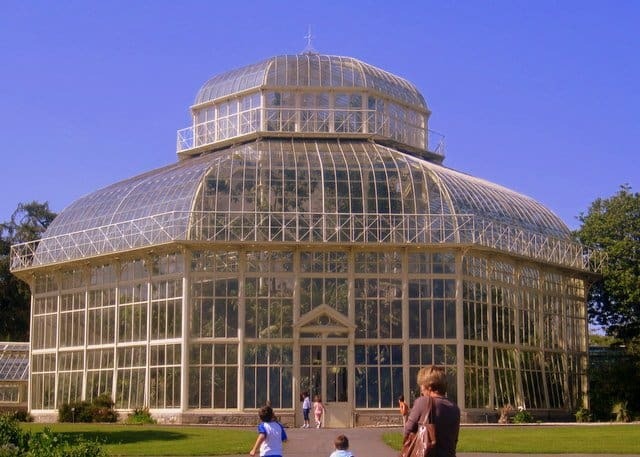 The National Botanic Gardens are located in Glasnevin to the northwest of the city center. Founded in 1795, the gardens are home to many beautifully restored glass houses. 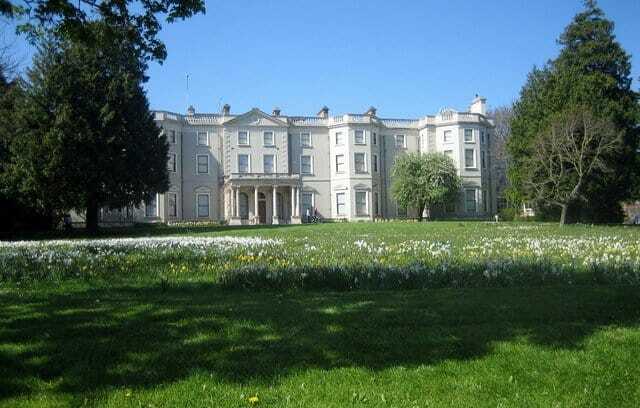 Farmleigh House and Estate once belonged to the Guinness family. It is now owned and operated by the Office of Public Works. Guided tours are available. Many cultural events are scheduled here throughout the summer season. The western county boasts a beautiful landscape of green fields lined by blooming summer hedgerows. 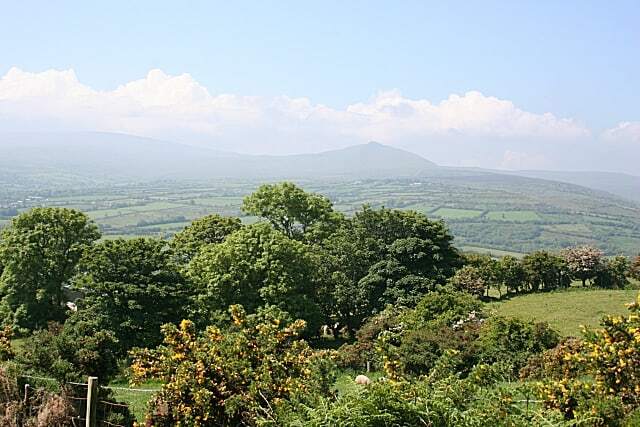 The Dublin Mountains lie to the southwest overlooking this verdant valley. Marino Casino lies to the north of the city. Built between 1750 and 1775, this casino is not associated with gambling. Its name is derived from Italian and means small house. Despite its name this casino actually contains 16 rooms. Home to the Lords of Howth, the St. Lawrence family, Howth Castle dates back to the 14th century. 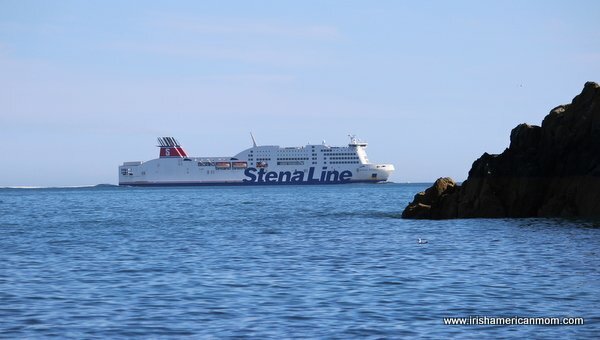 In 1576 the famous Irish sea queen, Granuaile or Grace O’Malley, attempted to visit the Baron of Howth. She was informed the family were at dinner and was refused entry. 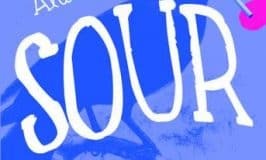 In retaliation, she abducted the Baron’s son, only releasing him when she was promised, from that day forward, a place would be set for visitors at the castle’s dinner table. This agreement is honored to this very day. 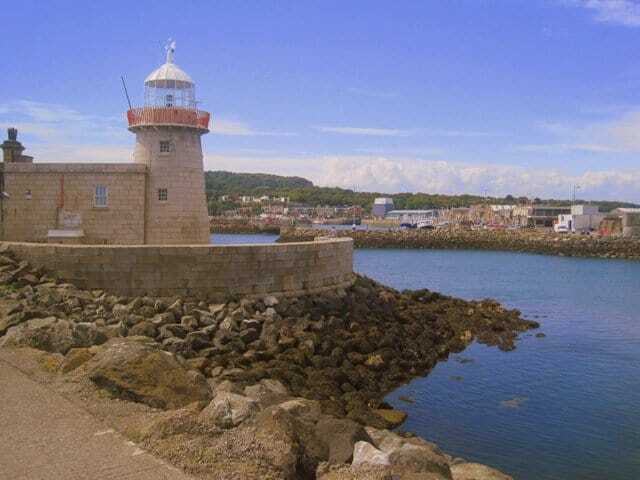 Howth is a magical fishing village with a magnificent pier, two lighthouses, cliffside walks and breathtaking views. Home to some of the finest seafood restaurants in Ireland, a great meal can easily be washed down by a cozy drink in one of Howth’s warm, inviting pubs. 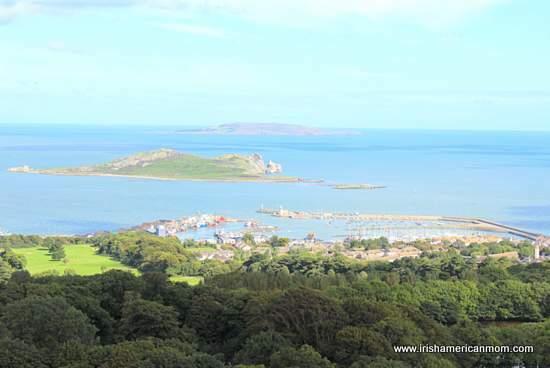 The islands of Ireland’s Eye and Lambay can be spotted to the north of Howth. Moving futher north along the coast, Pormarnock is home to a magnificent golf course which has hosted the Irish Open on many occasions. It’s beautiful sandy beach was one of my favorite summertime haunts. 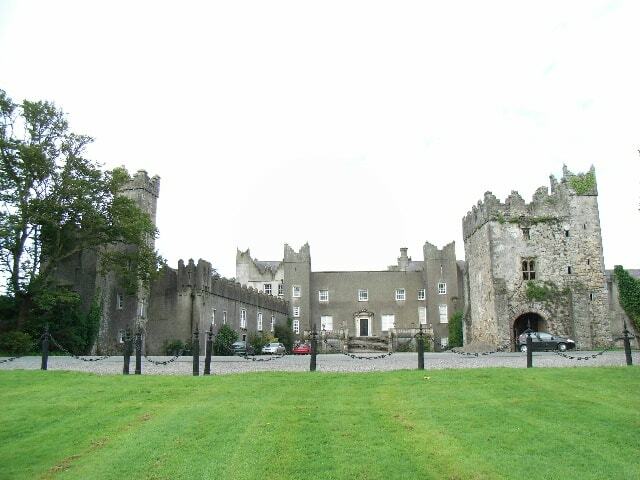 Malahide Castle is located in the quaint, seaside town of the same name. Home to the Talbot family for over 800 years, it is supposedly home to five ghostly figures, often spotted in the castle windows. 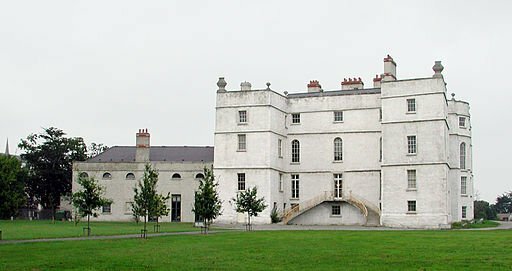 Here’s another link for information on Malahide Castle. 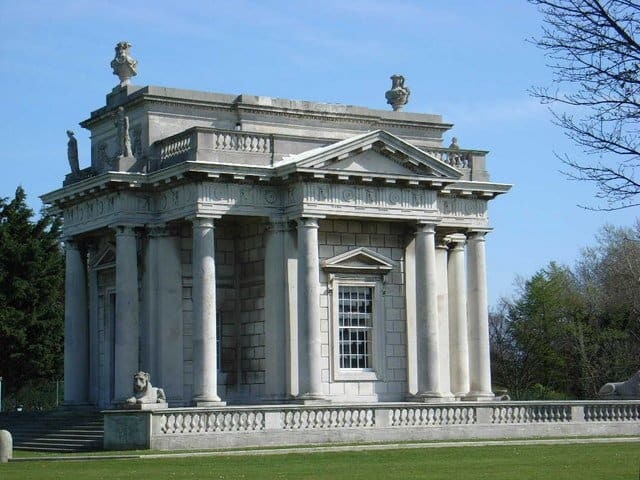 Located in Donabate, Newbridge House and Farm is an old Georgian Mansion and Demesne with a wonderful playground, beautiful gardens and a model 18th century farmyard. It is one of my children’s favorite spots to visit. 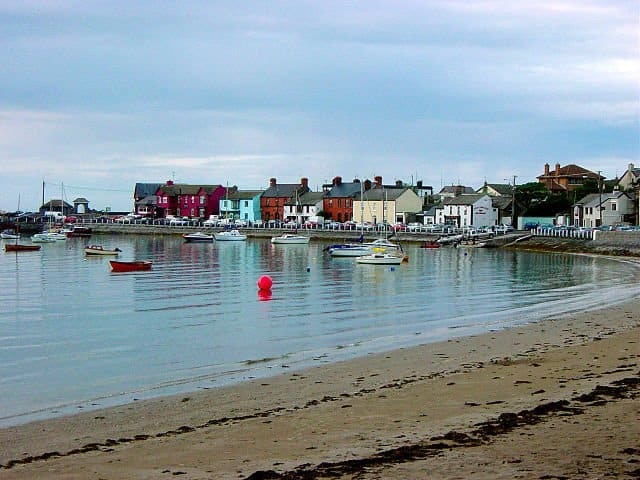 Skerries is a picturesque town with a watermill and two windmills, sandy beaches and a scenic harbor. 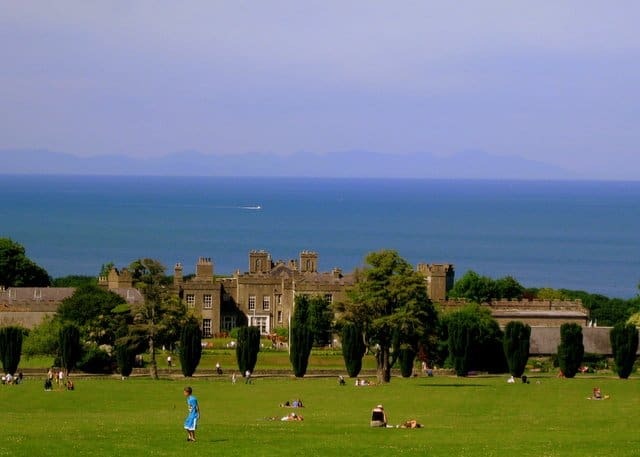 Ardgillan Castle lies a little further north, with magnificent views of the Irish Sea. On a clear day, the Mountains of Mourne can be seen in the distance. Look closely at the photo above, and you can see the shadowy mountains on the horizon. 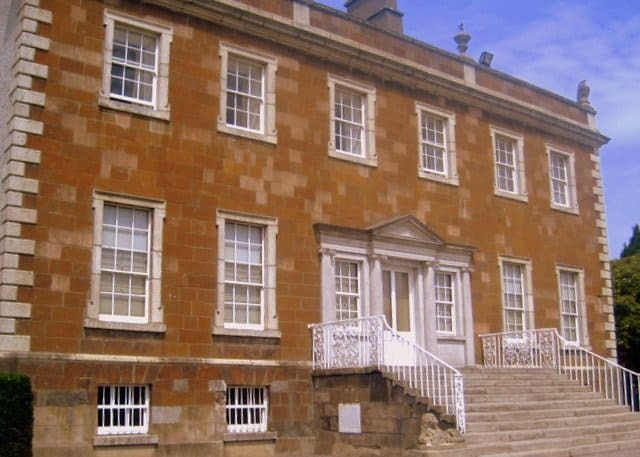 Rathfarnham Castle dates back to Elizabethan times. It is open to the public and home to a collection of 18th and 19th century toys, dolls and costumes. 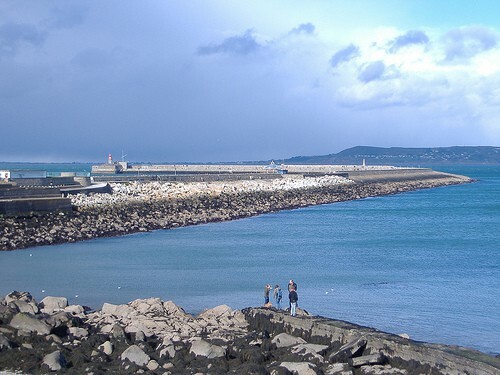 Dun Laoghaire lies about seven miles south of Dublin city. 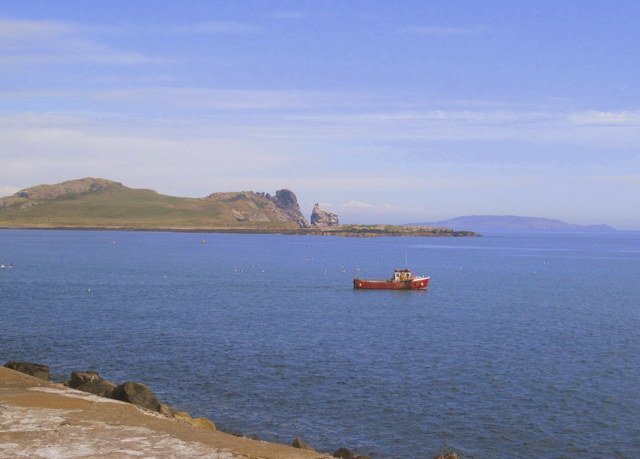 It’s harbor and pier offer lovely views of the bay and Howth Head. Further south in Sandycove, the Forty Foot was a “gentlemen only” swimming club in days gone by. Not until the 1970’s did women gain the right to swim here. 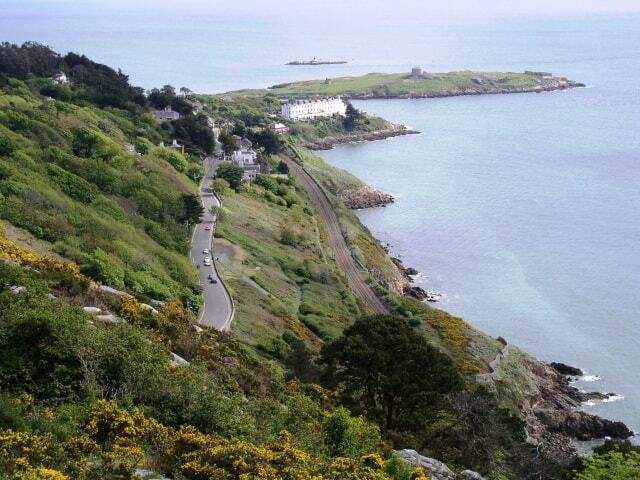 Dalkey Island can be seen in this photo taken from Killiney Hill. 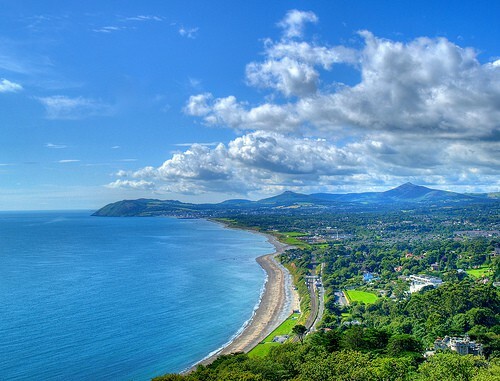 Looking south from Killiney Hill the beautiful coast can be seen as far as Greystones in Co. Wicklow. The DART (Dublin Area Rapid Transit) train line runs all the way from Howth to Greystones along the shores of Dublin Bay. A trip on the train provides access to some beautiful scenery. The Dublin mountains lie to the south and are home to some spectacular peaks, mountain trails, and ancient megalithic sites and stones. And so we conclude our quick trip around County Dublin. 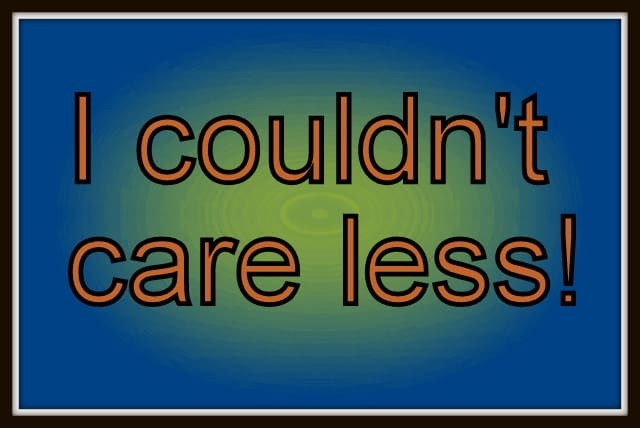 Forgive me if I have omitted your favorite site or attraction. I never even mentioned Dublin’s most famous daughter. 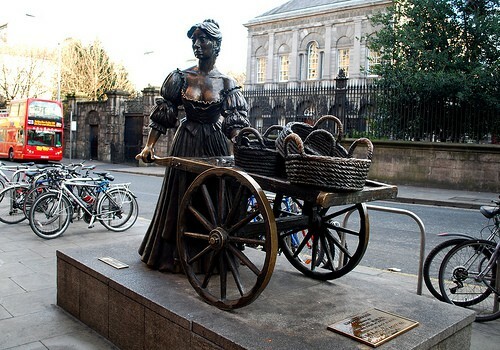 So here is a picture of Molly Malone with her cart to bid you all farewell. 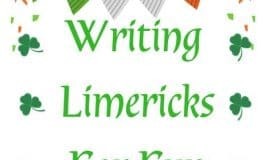 As I publish each new county post, I will add a link to the alphabetical list on my Ireland: County-by-county page.